Is there a fruit more iconic than an apple? I'm hard-pressed to think of one. From the Book of Genesis to the iPhone, the apple has long held a special place in our culture. Maybe you gave one to your teacher in elementary school or recall the legend of Johnny Appleseed, a real person who did help introduce apple trees to parts of the East Coast and Midwest. Perhaps you, like me, cannot wait until Thanksgiving to dive into a delicious apple pie. Perhaps you even remember Snow White being poisoned by one, but hopefully that didn't put you off eating them. The most popular fruit consumed in the United States, the banana, is an import, but apples are #2, making them this country's most popular domestic fruit. 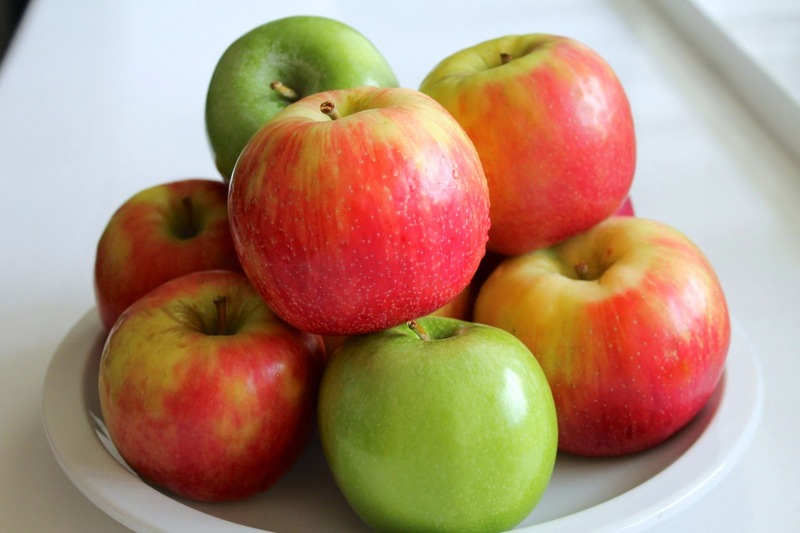 According to the U.S. Apple Association, apples are grown in every state in the continental United States. I have a special affinity for the top-producing state, Washington, since I went to college there. Other top producers include New York, Michigan, Pennsylvania, California and Virginia. One of the great things about apples are their versatility. They can be eaten raw without any preparation, making them an ideal snack, given their few calories and high fiber content. But cooked, you can do many delightful things with them: bake them into a pie, chop them up for salads, puree them into a sauce, incorporated them into pastry or bread, distill them, juice them, sauté them...the possibilities are limited only by your imagination. All this week I'll be featuring stories and recipes about apples. Today, I have a tasting of seven common apple varieties and a wonderful apple appetizer: Triple Smoky Apple-Blue Cheese Crostini. Tomorrow, I'll share a recipe for Apple-Potato Soup with Chicken-Apple Sausage and Parmesan Crumble, Wednesday is an all-apples edition of The Feed (my weekly round-up of food stories), Thursday I've got a great apple cocktail courtesy of a bartender from DC's Roofers Union (plus a bonus bourbon, honey and apple cocktail) and Friday I'll share a recipe for a delectable roasted stuffed caramel apple dessert. In the meantime, check out my recent round-up of great apples recipes. If an apple a day keeps the doctor away, stick with my site this week and you'll be in good health.